It's another beautiful day, and I am inspired to do some crafting. I'm in the mood. What though? My craft room is full of half finished projects. After spending a couple of hours rumaging through drawers and cupboards I have decided on working on this wonderful hand sewn hexagon quilt. I purchased this off an on-line auction site. 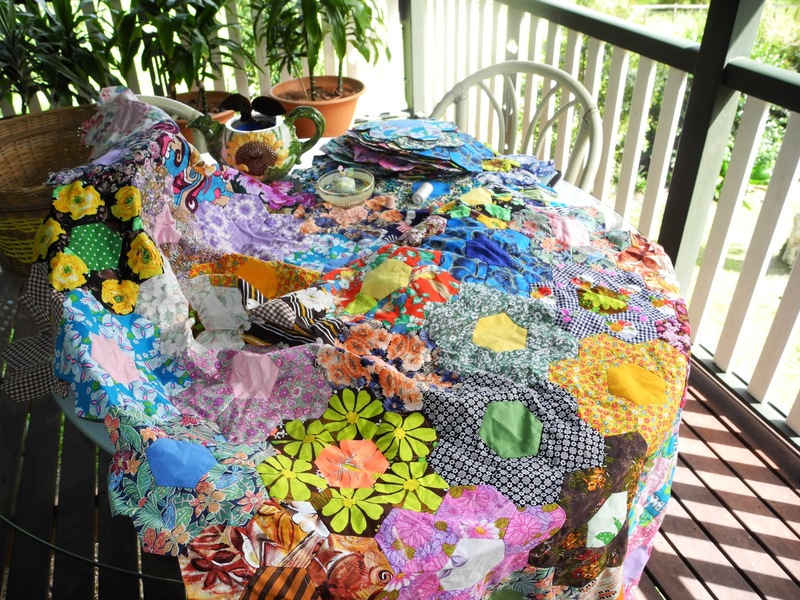 All of the pieces were cut and hand sewn into the flowers and about 10 flowers hand sewn together. I see myself as the completer of this quilt. The material and design was already chosen for me. Some of the newspapers used in the templates are dated from the 70's, as is some of the material. I can't wait to see it finished. The garden is looking wonderful. This is the view from the entrance side of the verandah. So jealous of your garden our vegetable patch was destroyed by a hail storm yesterday. Video on facebook.